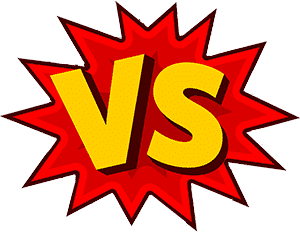 Bilstein 4600 vs 5100: Which is Better? Without shock absorbers, driving on the smoothest highway could feel worse than going through a gravel road. 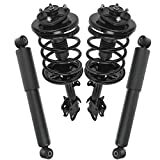 Shock absorbers improve your driving experience by helping your car have better handling and keep the tires directly in contact with the road. So if you are tired of always going through an unnecessarily harsh ride and have decided to get a shock absorber, then your choice has probably narrowed down to the Bilstein 4600 or 5600. The best way to get a suitable shock absorber is to look at the conditions surrounding your daily driving activities. For instance, if you spend a lot of time in your truck and your only fear is getting a whiplash after driving over every utility hole cover, then you need some strong shock absorbers. Forget those squishy soft factory dampers and go for shock absorbers that are sturdy and can resist overheating. My review will focus on what Bilstein 4600 and 5600 have to offer, their benefits and which one is the best fit for your car/truck. The Bilstein B6 4600 is a perfect blend of performance and comfort. It is the best shock absorber for passenger cars, from minivans to Mercedes Benz, Ferraris or Porsche. It also enhances the control and handling performance of your vehicle. The B6 4600 works on a distinctive, digressive and velocity sensitive piston which provides an instantaneous reaction to change in road conditions. You will move from a tarmacked road to gravel without feeling the hard effects of the bumps. At the same time, you will experience a consistent fade-free performance as you change your course. With precise adjustments done by the shock’s manufacturer, you are guaranteed of limited uncontrolled movement on light trucks and SUVs and increased suspension carrying capacity. You will also get a more comfortable staring feel for better control of your car. Digress valving on the shock also contributes to maximum comfort and control when changing road surface conditions. Monotube upside down technology makes this shock absorber the number one choice in series production sports cars and motorsports. It eliminates fade, aeration and offers a consistent and even valving. At the same time, this Bilstein cutting edge technology gave other manufacturers the idea of the perfect installation position for their shock absorbers. That is the upside-down installation technology. The B6 Monotube gas pressure technology works by keeping the oil in the absorber under constant pressure. This action prevents the oil from foaming when there’s an increase in temperature or loads. Full dampening power is therefore retained even when the system is under extreme stress, a feature commonly observed in a self-lowering piston. To attain the unique Bilstein driving experience, Bilstein technicians put the B6 4600 through severe road tests to simulate the driver’s experience. As a result, the B6 4600 is ensured to be a high-performance absorber and is also associated with driving safety. 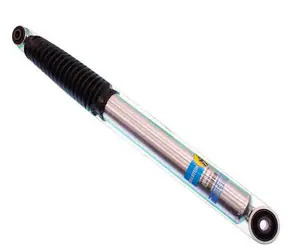 Bilstein B6 4600 is a high-end shock absorber, and you get it for a reasonable price. It is pressurized with nitrogen meaning that you will get constant performance for the longest time. It is easy to install the shock, and you can DIY the installation from the comfort of your own home. It works well for both your front and rear wheels, and Bilstein’s limited warranty has got you covered in case something goes wrong. You will know that these shocks are useful when your family starts commenting on how smooth the ride is. B6 4600 is the best replacement solution for OE and the best shock absorber for people looking for suspension performance enhancement. The Bilstein 5100 series is suitable for more heavy stock vehicles, lifted trucks jeeps and SUVs (basically anything not factory) and has been tailored to take on the most stringent dampening demands of such cars. The 5100 series uses Bilstein’s gas pressure technology to enhance a vehicle’s handling qualities on/off the road and at the same time maintain a smooth ride. This gas charged shock also ensures stability even when injected with large amounts of force. The 5100 series shock is pressurized with 360 psi of nitrogen gas to limit shock fade and prevent foaming on the shock fluid. The 5100 is a custom fit shock absorber that’s engineered for different lift combinations and vehicles. They are therefore easy to install as their direct bolt-on installation plan requires no alterations/modifications on your truck. The monotube design of the rod makes it suitable for rugged terrain and heavy loads because the damping power is higher than twin-tube designs. The monotube design also makes the shock stiffer and hence more resistant to wear. What you will notice about the 5100 shock is that the response will differ depending on the vehicle you have. The reaction on a heavy duty 1 ton or ¾ ton vehicle will be different from a similar ½ ton jeep. The latter will feel lighter in comparison. The 5100 series of shocks are a popular choice as it runs the visible 5100 on a stock height truck and leaves room for another lift that may occur as you ride. Plus, it is the only reasonable choice for a shock absorber in lifted trucks. What’s more is that it drastically improves your ride experience and is the perfect replacement for OEM rear shocks. As we said earlier, the best shock will entirely depend on your driving condition. If you are more into fire roads, hauling equipment or off-roading on a daily basis, then the Bilstein 5100 is a winner for you. The 4600 is more suitable for vans, SUVs and stock height trucks that do not undertake heavy duty activities. It is, however, a more expensive shock absorber in comparison to the 5100 but with a higher price comes even greater qualities. Both shocks, however, carry plenty of similar characteristics in that they use the same monotube gas technology, have 360 psi of pressurized nitrogen and the outer construction is quite identical. 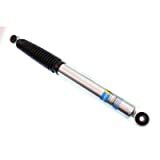 They, therefore, stand for the quality that is Bilstein, and you are sure to get at least five years of service from these shocks. What is a Bilstein shock? Do Bilstein shocks have a lifetime warranty? How long do shocks last? Can Bilstein shocks be mounted upside down? Where are Bilstein shocks manufactured? Bilstein was birthed in Ennepetal In 1873 and has gained 50 years’ worth of experience in gas pressure and shock absorber innovation and manufacturing. Their products are built in state of the art facilities in the United States and Germany. It was the first company to come up with monotube-gas shock absorber technology and also the first to gain a patent on gas pressure principle in regulating ride characteristics on automobiles. 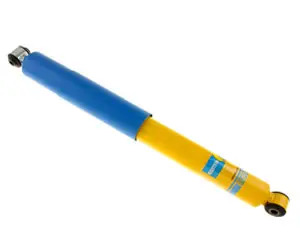 Bilstein has also spread its wings in the production of twin tube McPherson strut style suspensions that are tailored to be highly durable and also withstand maximum loads. Both Bilstein struts and shocks are taken through extensive tests and developments to ensure that they meet the performance and fitment needs of automobiles and that is why they are a go to in the motorsport industry. Bilstein is forever committed to road safety and manufacturing products that enhance the driving comfort of automobiles. 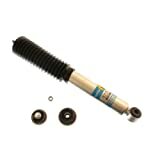 Bilstein shock is a shock absorber that provides a smooth ride, comfortable handling, and control. Bilstein shock absorbers are patented and provide the necessary damping for an instant reaction to hazardous road conditions without compromising on the ride comfort. The shock absorber is made up of a combination of high-pressure nitrogen gas and valving that keeps your vehicle’s tires on the ground regularly to enhance safety and vehicle control. Bilstein offers its customers a limited lifetime warranty to the original retail purchaser of gas pressure shocks. For starters, the shock absorber shall be free of defects in craft and material. In case of a defect, you must present proof of purchase to the original place of purchase to process warranty. Generally, shocks can take you up to 50,000 miles or 5 years before you need to replace them. That mileage may, however, be reduced if you do plenty of off-road driving, motorsports racing or you spend more time on dirt roads. Rugged roads put a lot of strain on shocks and cause them to wear out quickly. Abrupt reactions via the steering wheel and long brake distances are changes that can also cause wear shock. So in short, if you are a careful driver, then you might get more life from these babies. Dampening is the process by which a shock absorber controls unwanted spring motion. The shock absorber, or otherwise known as a damper or snubber slows down and reduces the intensity of vibratory motions by converting the kinetic energy of the suspension movement into heat energy that can pass through the hydraulic lift. Unless the dampening structure (shock absorber) is present, a vehicle’s spring will emit the energy it absorbs from a bump in say, a rough surface, at an uncontrolled rate. The new dampers is velocity sensitive meaning that it provides more resistance as the suspension moves faster. This feature also enables the damper to adapt to changes in road conditions and control unwanted motions when a vehicle sways or bounces. Bilstein tech recommends that you should mount the shocks with the Bilstein Logo facing the right-side-up. After you do it, you will find that you will eventually end up with the shock being upside down. Bilstein boasts of its Monotube upside-down technology as being original and the best and hence its widespread use in the motorsport world that has triggered many imitators to copy the same installation for their shock absorbers. The company’s main headquarters are in Ennepetal, Germany where it was initially founded. It has manufacturing facilities spread out in Shanghai, China, the United States (Ohio, Poway, San Diego, and Hamilton), and Mandern, Germany and in Sibiu, Romania. Triggered by an idea by Prof Bourcier de Carbon, a French researcher, Bilstein became the first to realize the potential in shock absorbers that make the dampers lighter and a custom fit for any vehicle. After years of dedicated research and hard work, Bilstein gained recognition in the tech industry as a high tech brand in the field of suspension design, safety and driving comfort. Seeing its potential and need to be expanded for future investments, Bilstein was acquired by ThyssenKrupp Technologies AG in 1988 and was later incorporated in 2005 as their wholly owned subsidiary. This partnership and cooperation are what has made Bilstein Group a well-known company. Shock absorbers are suitable for cushioning your ride and also perform other safety functions for your ride. They keep the wheels firmly on the ground, Improve vehicle maneuverability as well as the handling. If you have worn out shock absorbers, you will experience wheel hop which is damaging to your tires and also dangerous. Worn shocks lead to the premature wear of tires and often leak oil if the shocks are damaged around the shaft area. If you notice that you have a leaking shock absorber, it is a clear indication that you need to replace them and there is no better replacement than Bilstein shocks. Our reviewed gas coil-over shocks, Bilstein B6 4600 and 5100, are suitable OE replacements that best fit your driving style and any road condition that your vehicle travels on. The best part is that they come in custom fit designs with features that you exactly want.